Elvis was known for many things: singing, dancing, acting… but he wasn’t exactly known for his good taste. But, as Pablo Picasso said, “Ah, good taste! What a dreadful thing! 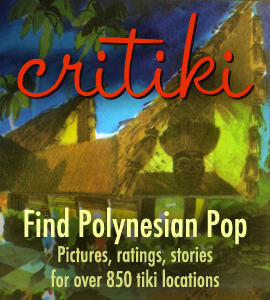 Taste is the enemy of creativeness.” (It’s worth noting that Picasso was a tikiphile; he acquired his first, a Marquesan, around 1910, and in later years had them all over his art studio.) And so we have Elvis’ paean to bad taste, his Jungle Room at Graceland. Elvis’ Jungle Room is furnished almost entirely with Witco furniture, a blocky style of wooden carved furniture created by William Westenhaver that reached its height of popularity in the 1960s. Most homes housed maybe a piece or two of Witco, but a whole room of it can be visually overwhelming. Elvis, of course, could handle a little visual stimulation, and went gangbusters — not only does his Jungle room house a full couch, a half-dozen chairs, tables, a cabinet, and a tiki bar (with tiki stools), but the whole room is carpeted in lime green shag, not just on the floor, but also the ceiling. It is atrocious, in the best way possible. The official website for Graceland provides two virtual tours, which give 360° views, and allow you to zoom in and out. The Virtual Tours actually give you a better view in some ways than you can get there in person, where the room is roped off and must be viewed from the side. There’s also a great thread underway on Tiki Central, where a woofmutt has collected a variety of Jungle Room lore with some tidbits thrown in by Sven Kirsten (whose book on Witco will be out next year). Included is a story of Elvis’ dad, Vernon, telling him he’d just seen “the world’s most ugliest furniture” in a store in town, only to discover that Elvis had coincidentally just bought the whole set that same day. That room makes me want to dig right in and Do The Clam. I think that maybe Oscar the Grouch’s mother died to make that carpet possible. Except for the Witco, it looks almost exactly like the inside of my mom’s mobile home. I think I read somewhere that that was exactly the look Elvis was shooting for: MrBaliHai’s mother’s mobile home, circa 2010. Pretty impressive that he nailed it. Well, except for goofing it up with all that Witco. Pretty impressive that he nailed it. That’s why he was The King. Wow, that’s something else. At least he went all out. I have a WITCO CHAIR & footstool for sale. Also a wall candle holder. Contact me if your interested. These are ORIGINAL vintage pieces made in the 1950’s. Luckily, there’s a truly ideal source for Witco replicas. Ken Pleasant is the grandson-in-law of Witco founder William Westenhaver (Ken married Westenhaver’s granddaughter). Westanhaver has taught Ken everything he knows, and Ken has been selling his own tikis in the Witco style, and also some reproductions, for years now. He posts on Tiki Central as keigs20. Ken has a website in the works — as soon as it launches, I’ll be posting all about him and his great art! I am doing a room in my house as the Jungle room and am having a hard time trying to find a waterfall similar to the one in Graceland…can anyone help? I visited Graceland 2 months ago, and I loved the Jungle Room. A classic. In 75-77 Elvis was tired of going to studios to make records, so he turned the Jungle Room into a recording studio and cut his last records there. The green shag carpet on the ceiling was for sound proofing (so Lisa Marie or anyone else upstairs could get some sleep!). I ABSOLUTELY LOVE HIS JUNGLE!! !I AM OPENING UP A SALON AND DAY SPA AND MY DECOR THEME IS ELVIS, MARLYN, AND JAMES DEAN. AS TO GO RIGHT ALONG WITH THE SALON NAME…..ADDICTIONS SALON & DAY SPA….MY FACIAL ROOM IS MY JUNGLE ROOM…. ITS GREAT!! I may be interested in the chair. Do you still have it for sale? Anyone interested in Jungle room furniture for your specialty purchase may give me a call. I may have a chair for sale. I have always wanted to go on a tour of Graceland. I understood Lisa Marie having married Michael Jackson a W-H-O-L-E lot better after seeing the Jungle Room. Somehow something clicked. That and all of Elvis’s uniforms and hats. There was a chair in the Jungle Room with a round seat that they said Lisa Marie liked to curl up in as a little girl to take a nap. This is funny. It just shows that people see things differently For me, I believe that beauty is in the eyes of the beholder, especially with people. No one can truly say that a person is not beautiful because that is just an opinion. A person might not be beautiful in one’s sight but could be beautiful in another person’s sight. Wow, I bet Elvis the Pelvis was inspired to create his Jungle Room Tiki shrine by the movie he made in Hawaii called Blue Hawaii (early 60’s). I was very happy to see Mr Westenhavers name mentioned. I was fortunate to grow up next door to Him & his family in the late 60’s, and 70’s when I was a kid. His son ( TY ) & I were friends ,and I lived with them for a short time when my mom was sick. A note for everyone , Their custom build house was like the Jungle Room including the Beams in the ceiling , and the Sunken TV Room , and all the Furniture ( Of Course ) was Custom Whitco.